The foundation of our Australian modern democracy. Why mark the 800th Anniversary? This massive document was revised several times - reissued in 1216, revised in 1217 and 1225, and a 1297 version was brought into English law virtually unchanged from the 1225 version. One of only four of the authentic copies of the 1297 version remains in the custody of the Australian Parliament. It embodies the principles underpinning the emergence of parliamentary democracy and the legal system in the UK, in the free world more generally, and especially in Australia: limiting arbitrary power, curbing the right to levy taxation without consent, holding the Executive to account, and affirming the rule of law. These are principles too often taken for granted, and often not fully understood. They are the foundation stones of our major institutions, notably our Parliament and our Courts. Magna Carta and the freedoms it espouses are also fundamental to the values we have cherished for centuries. And they are values that should unite us all, especially as these days they are being challenged by those opposed to the rule of law. Freedoms enjoyed by hundreds of millions of people from hundreds of countries today. Lord Worcester, Chairman of the Magna Carta Committee. So what is the contemporary relevance of the Magna Carta? It is the foundation stone of the freedoms enjoyed by hundreds of millions of people in more than 100 countries worldwide. It enshrined the rule of law in our society. It limited the power of authoritarian rule and enshrined the principle that no one is above the law. It paved the way for trial by jury. It linked taxation to democratic government - the slogan ‘No taxation without representation’ being a fundamental theme of the American Revolution. It proclaimed certain religious liberties. It has influenced constitutional thinking worldwide including in the USA (notably the Fifth and Fourteenth Amendments), Europe, the Commonwealth (including Australia), and in over 100 other countries, as well as the UN Declaration of Human Rights. Denials of Magna Carta’s basic principles have led to loss of liberties and human rights, even genocide, in many countries over the centuries. After years of autocratic rule in England a group of rebellious barons forced King John with some tricky war-mongering to authorise the Magna Carta. 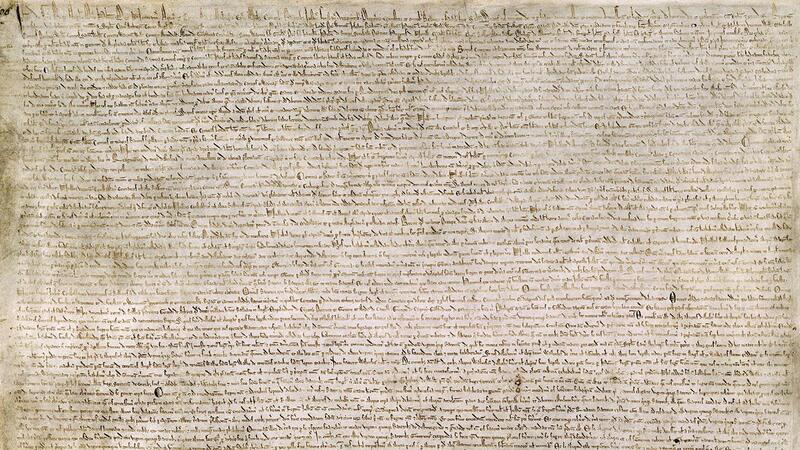 This “Great Charter” established the principle that everyone, including the King was subject to the law. It also guaranteed the rights of free men, the right to justice and the right to a fair trial. Written in Latin, 13 copies were created, sealed with the King’s mark and distributed throughout the land. Since then the Magna Carta has become the foundation of parliamentary democracy. Democracy has been achieved through an evolution and the Magna Carta is a building block that has influenced many other charters, petitions, bills and constitutions. These documents are marking points along the path to modern democracy. What is still relevant about the Magna Carta today to Australians? Our democracy, Constitution and parliamentary system have been built upon the legacy of Magna Carta and events that occurred in the last 800 years. Our great democracy balances our freedoms with our rights and responsibilities. As we approach the 15 June 2015 800thanniversary of the Magna Carta more and more eminent world leaders are claiming it as one of history’s most important documents. The Magna Carta has a turbulent, bloody and double-crossed beginning and influenced many centuries as countries explore their best system of government. But few dispute it represented the beginning of modern liberal democracies. Magna Carta is claimed as the beginning of law and liberty and as the foundation document of our modern democracy, along with the idea that authorities can’t make up the rules as they go along. The Magna Carta is the original source of the Rule of Law. It gave legal parity among all free men and the right to a trial by jury. The King became constrained under the law, overturning divine rule. In later centuries the executive, legislative and the judiciary would have their own defined and limited powers under constitutions. It gave limited rights to women - widows could not be forced to marry against their will. We hope all CEFA supporters will help us follow the worldwide celebration of the Magna Carta which officially launches 15 June 2015.